Interviewer: Is there anything I can answer for you? Candidate: No, I think I know everything I need to know. Let’s face it. Do you really know EVERYTHING you need to know about the company you’re interviewing at? You should assume that every interviewer will allow you an opportunity to ask questions of them. I urge you to ask them! Engaging the interviewer shows them that you are a part of the conversation, and that you are interviewing them as well. After all, you will have to be working with them. On top of looking like you are genuinely interested in the company and the team, it shows you came prepared. At the end of the day, remember that an interview is just a conversation. It should never be question-answer-question-answer. Make it interactive; make it a give-and-take. 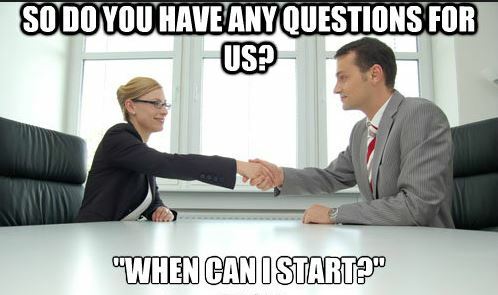 Don’t be afraid to ask questions mid-interview. Don’t be afraid to interject if you are confused about the job duties. Just as much as the company is interviewing you, you are interviewing them.